"Yael and Her New White Dress"
Yael is thrilled with the new beautiful white dress Savta bought her! But right before Rosh Hashanah, her dress gets stained at her cousin's Bar Mitzvah. Will her mother be able to clean it? As she waits anxiously, she thinks about how the shofar reminds us to fix our mistakes and become all clean inside too - just like her white dress! A sweet Teshuva story for this special Rosh Hashanah/ Yom Kippur season! Yael and Her New White Dress is part of the Yael Yom Tov Series. 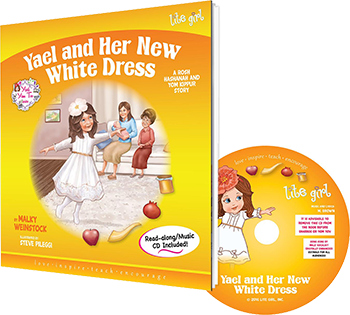 Yael and Her New White Dress picture book plus audio CD set. "Yael and the Shining Menorah Lights"
A beautiful Yael Story set in a Chanukah Setting, containing a year-round, heartwarming, message of "spreading the light." 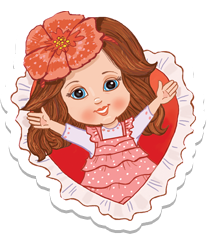 Join Yael as she musters up the courage to visit and cheer up their old sad neighbor, and be inspired to do a copycat kindness with your lonely, needy, sad friends, neighbors or relatives! Yael and the Shining Menorah Lights is part of the Yael Yom Tov Series. 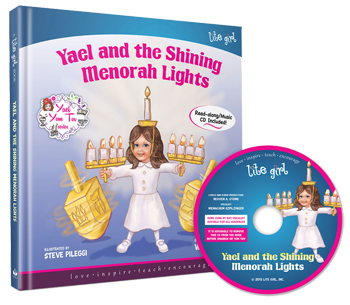 Yael and the Shining Menorah Lights picture book plus audio CD set. Yael discovers the excitement of Pesach! Join Yael as she discovers the beauty and wonders of our heritage and learns why we prepare for Pesach so happily. Yael's Pesach Dance is part of the Yael Yom Tov Series. 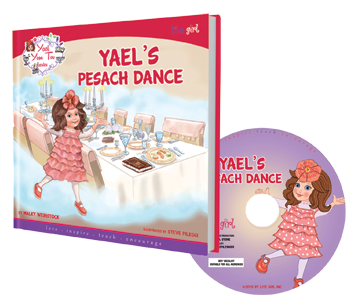 Yael's Pesach Dance picture book plus audio CD set.